For a decade after the invention of the scanning tunnelling microscope (STM), comprehensive mapping of the complete electronic structure of a material in r-space N(r,E) or of its k-space electronic structure E(k) had not been contemplated. We introduced and demonstrated (Rev. Sci. Instrum. 70, 1450 (1999)) a design for a spectroscopic imaging scanning tunnelling microscope (SI-STM) allowing electronic structure visualization as a powerful general tool for solid-state physics research. Building on that method, we have developed instruments to achieve the following quantum visualization techniques: Spectroscopic Imaging STM (Nature 403, 746 (2000)); Quasiparticle Interference Imaging (Science 266, 455 (2002)); Superconducting Order Parameter Determination (Science 357, 75 (2017)); Kondo Heavy-Fermion Visualization (Nature 465, 570 (2010)); SJTM Cooper-pair Condensate Visualization (Nature 532, 343 (2016)); Orbital Selective Quasiparticle Visualization (Science 357, 75 (2017)). Fig. 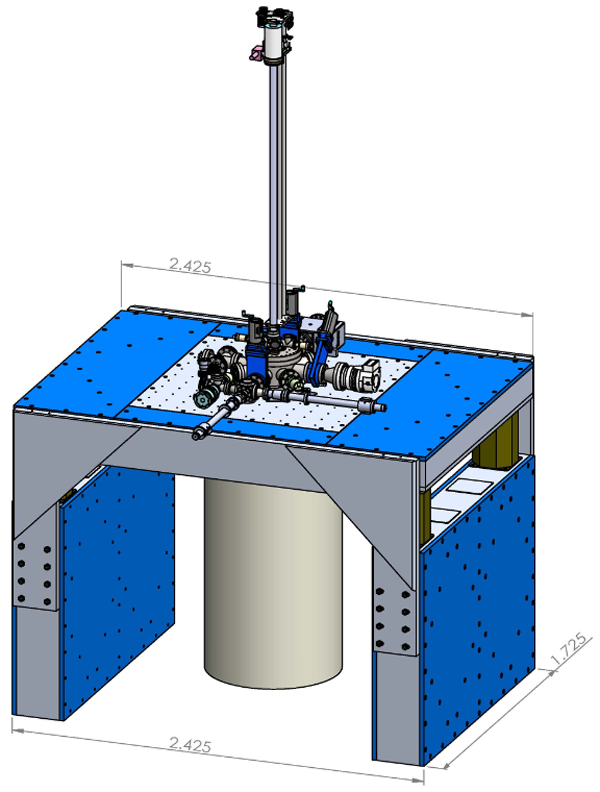 9 Schematic of the externals of fourth the generation quantum microscopes designed specifically to operate in the ultra-low vibration (ULV) laboratories in the basement (20m underground) of Beecroft Building – Oxford, where three instruments with distinct capabilities are planned. Three other quantum microscopes with distinct and complimentary capabilities will be housed in the Kane Building at UCC. a)	A mK SISTM quantum microscope, operating down to T=250mK and at magnetic fields up to 16T. Its planned uses include Cooper-Pair Condensates & Topological Kondo Insulators. b)	A mK SJTM quantum microscope, operating below T=50mK and at magnetic fields up to 12T. Its planned uses include Magnetic Topological Insulators & Cu/Fe HT Superconductors. c)	A mK SNS quantum microscope, operating down below T=50mK in zero field. Its planned uses include Magnetic Monopole Fluids & Viscous Electron Fluids.